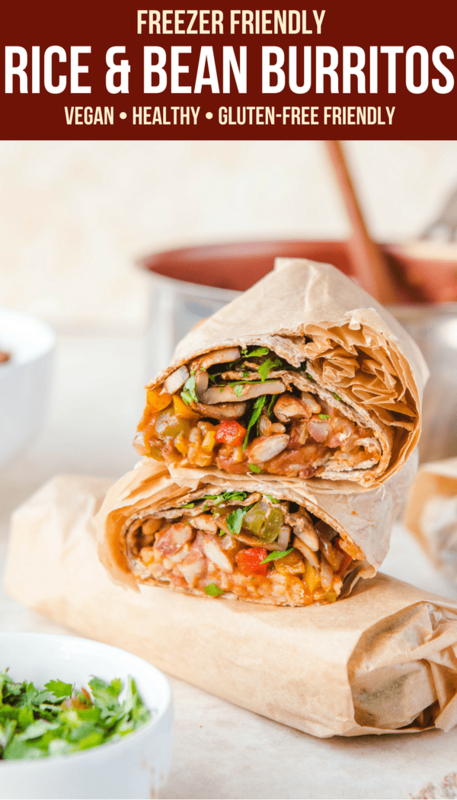 These Rice & Bean burritos taste AMAZING, but are so easy to make! They’re also freezer-friendly, which make them perfect for an easy Dinner, Meal Prep or a Grab-and-go Meal. I know, I know. Every time I see a recipe title with “the best” in it, I get a little dubious too. But guuuuuuuys, these Rice & Bean Burritos are SO. freakin. good. Honestly, you can just make the Rice & Beans, stuff it in a tortilla, and call it a day. However, I wanted to get a liiiittle more fancy than that. So I whipped up some zesty Fajita veggies in my sauté pan, and I also decided to add in some fresh Cilantro for a little extra flavor. Yum! 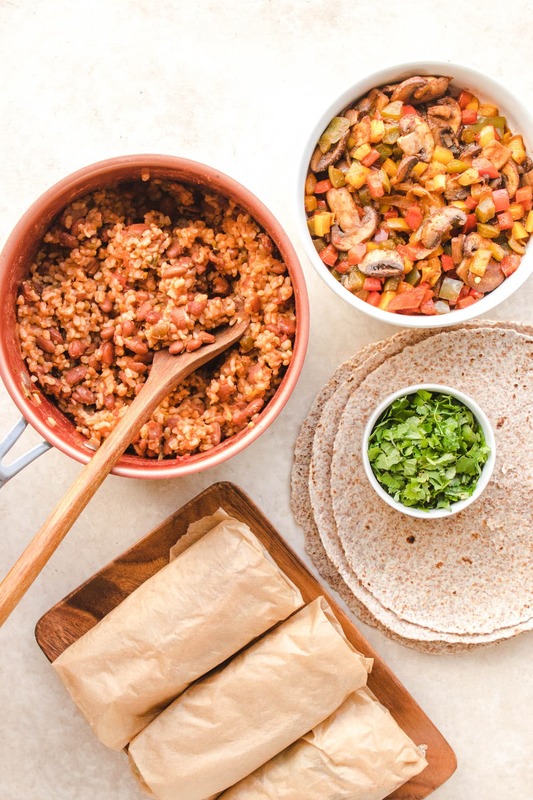 These burritos are so dang good, I would even consider eating them for breakfast. And I hardly ever eat savory food for breakfast at home! 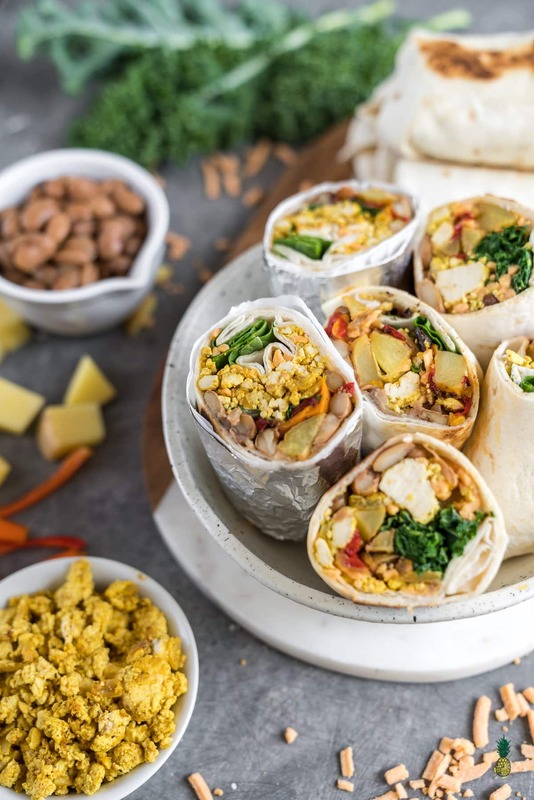 However, my friends Jasmine and Chris of Sweet Simple Vegan did create an epic Freezer-Friendly Breakfast Burrito recipe which is also challenging my sweet breakfast habit. So, you know, you have options. This recipe is super versatile. Feel free to add in extra veggies, greens, or even vegan cheese! Personally, I would not add Avocado/Guacamole (it gets weird in the freezer — use it as a dip on the side instead) nor White Potatoes. Every time I freeze and thaw Potatoes, they take on a weird spongy texture. A lot of you asked me for healthy Tortilla recommendations – I will admit, they are hard to come by! I used these Sprouted Tortillas when making & photographing this recipe, but they did break apart some. I also wish they were a little bigger. Please leave a comment if you have a Tortilla that you love! If you’re looking for more simple & tasty recipes, you’ll also love this Pasta with Romesco Sauce and these Sheet Pan Fajitas with Chipotle Lime Tofu! If you’re not making your Rice & Beans in the Instant Pot, add all Rice & Bean ingredients to a medium pot, bring to a boil, cover, and let simmer for 40 minutes. Turn off the heat and Let stand for 5-10 minutes before fluffing with a fork. While the Rice is Cooking, saute your Fajita Vegetables. Add a splash of Water or Oil to a pan and cook the Onion over medium heat, until translucent. Next, add the diced Bell Peppers and cook for an additional 3-5 minutes. Once the pan is “dry”, add in all of the dry Spices and toast in the pan for 1 minute. Finally, add the sliced Mushrooms to the pan with a splash of water, and let them cook down until dark brown and small, stirring the Vegetables occasionally. Set aside until the Rice and Beans are ready. 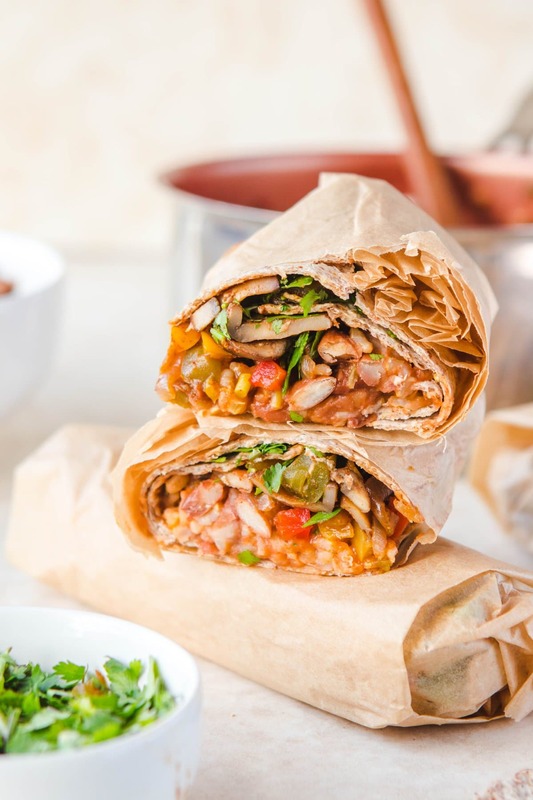 Assemble your Burritos by placing the Rice & Beans, Fajita Vegetables, and some fresh Cilantro leaves slighly below the center of the burrito. Roll your burrito up (see how I did it here), then wrap in parchment paper (see notes). Serve warm, or place in a freezer-safe bag for up to one month. 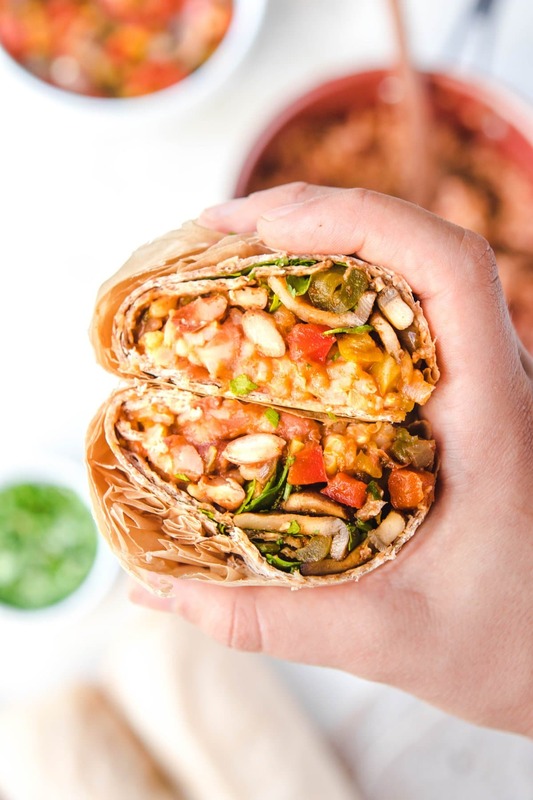 REHEATING INSTRUCTIONS: If you do freeze your burritos, simply place them (parchment paper and all) on a microwave-safe plate and Microwave for 90 seconds. Flip the Burrito over, then Microwave for an additional 60-90 seconds. I used these Sprouted Tortillas when making & photographing this recipe, but they did break apart some. I also wish they were a little bigger. Please leave a comment if you have a Tortilla that you love! 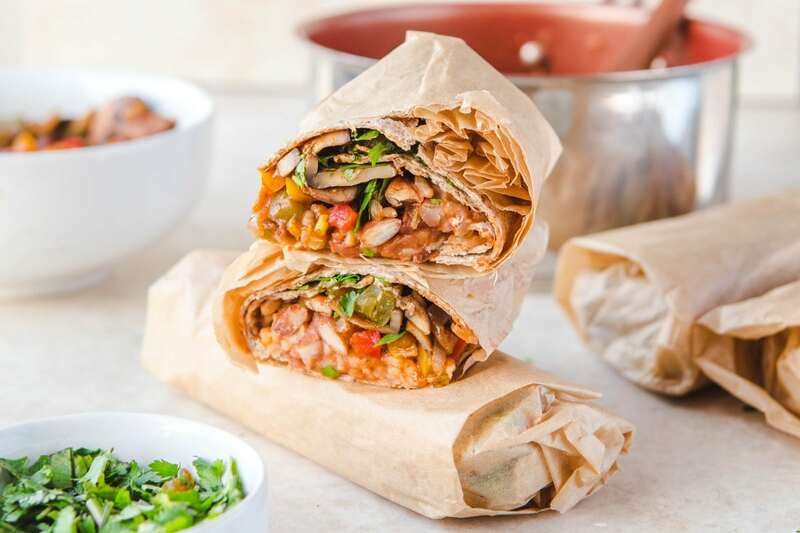 Finally, if you plan on reheating these burritos, DO NOT wrap them in Aluminum Foil! It is not microwave-safe. I wrapped my burritos in this Unbleached Parchment Paper. This recipe looks wonderful–I could just eat the rice and bean filling on top of greens or on top of nachos too! 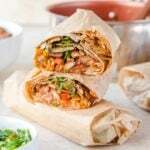 What tortillas did you use to wrap the burritos? 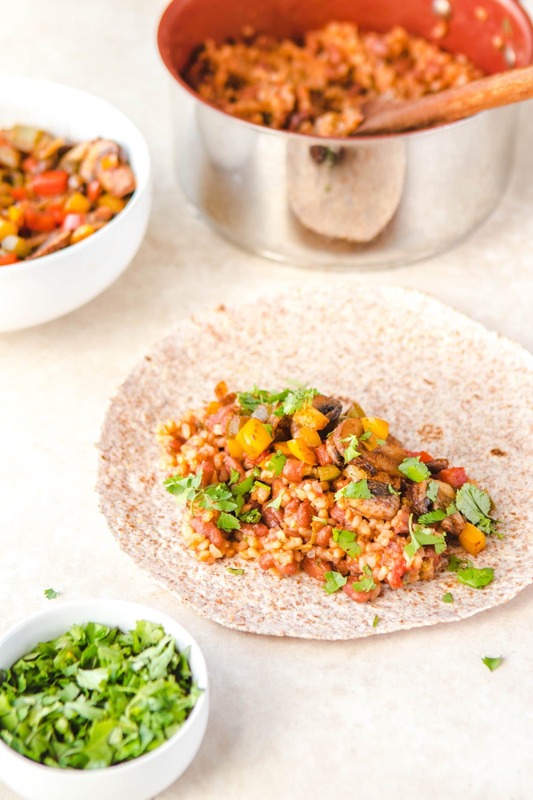 They look like the Food for Life brown rice tortilla wraps! Hey Caitlin! I was wondering if you have a recipe for salsa? I don’t at the moment! If I wanted to use white rice would I change the cooking time or anything? Soooo delicious! Totally making this! Can you reheat the burritos if you don’t use a microwave? Yes, you could use the oven as well! Ditto on your comment about the salsa and broth not mentioned in the directions, however, we both figured it out, not too hard. These burritos are the first I’ve ever made and they are incredible! I used all suggested ingredients except mushrooms ’cause I don’t care for them. Easy to make and it makes a lot. I really like the freezer part. I am a widow and cook for myself, so this large amount has to be frozen. I used the smallest ball jars and froze individual servings so that I can just pull it out and thaw in the microwave when I’m craving one. The burritos are then fresh, not frozen. Can’t say enough about this recipe. Oh, also the first time I’ve made brown rice, and I’m impressed. Thanks for posting! Love all your recipes including this one!! I also noticed (saw some other comments saying the same thing in the rice and bean instant pot post) that the rice and beans were not quite finished in some places. When I make this again I will do about 5-10 minutes longer in the cooker and see how that goes. 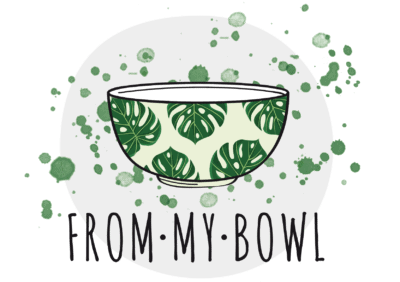 Thanks for being amazing and coming up with simple, fantastic recipes! Thanks for the feedback, Corey!